Abstract: Power plants concerned with lowering NOx emissions are making tremendous changes to accommodate EPA regulatory requirements. A substantial number of these changes include the expansion and upgrade of the plant combustion oxygen measurement equipment. 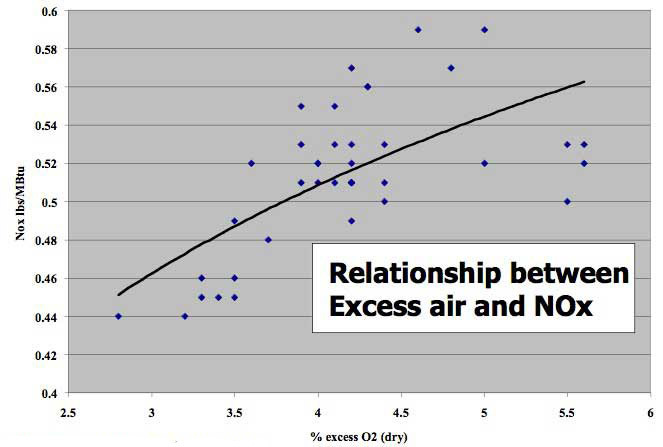 There is a striking relationship between the number of NOx reductions projects and the sales quantity of insitu oxygen detectors. The reason is that power plant betterment groups, operators, boiler manufacturers and engineering firms understand the direct relationship between NOx and excess air in the combustion process. It is useful to understand the basic principles of the combustion oxygen measurement; particularly, to recognize the effect of measurement errors on the performance of power boilers. This paper is designed to help boiler experts further understand this parameter and its effects on boiler emissions, fuel usage and control. In a simple overview of a steam power plant, heat is used to create steam that is used to spin a generator that creates electricity. The heat required to convert water to steam for the process is gathered from different sources. The most common method is the burning of a carbon-based fuel like, coal, natural gas, wood, or oil in the presence of oxygen. The choice of fuel used at a particular plant depends on geographic region, boiler type and fuel price. Oxygen is available everywhere and is found in sufficient amounts in common air. It is currently free. The efficacy of the combustion process governs the safety, fuel usage and emissions of the heat generation process. There are hundreds of events and details that affect the combustion process. Changes in the type of fuel, boiler steam load, and ambient air humidity ultimately change the fuel / oxygen mixture of the combustion. A particular amount of a fuel will consume a fixed amount of oxygen when it burns. Air contains about 21% oxygen at sea level. It is the primary source of oxygen for combustion. The amount of oxygen remaining after combustion is an indication of how much air is present during the combustion. Too little air in the combustion prevents all the fuel from being burned; wasting fuel and creating a potential for explosion. Conversely, too much air (excess air) requires extra heat to maintain the combustion reaction. Nitrogen, accounts for nearly 73% of air and is not consumed in a useful way during combustion. It only adds thermal mass to be heated with the useful oxygen at a ratio of 3:1. Variations in the burning process require minor changes to the fuel / air mixture to maintain the correct ratio and efficient boiler operation. The process of adjusting the fuel or air is called boiler trim. Methods of boiler trim vary by boiler manufacturer, fuel type and control scheme. Some schemes control the amount of air injected into the system, others control the amount of fuel, and still others control both. However, in any scheme, it is critical, for safety and efficiency, to know the amount of oxygen in the process. Most power plants use a measurement device that continuously measures oxygen content near the combustion zone. Logically errors in the air measurement have direct effect on the control of the boiler, including process safety and plant emissions. It is a general rule of thumb that a 10% increase in excess air will increase fuel usage by 1%. The fuel usage is greatly increased when the boiler is operating in oxygen deficient conditions. Excess, excess air has implications on boiler fuel usage and safety, but also on emissions, specifically related to the creation of NOx (Fig 1). The availability of the extra nitrogen found in air and the additional heat required to maintain combustion temperatures are favorable conditions for the formation of thermal NOx. It is necessary to keep some excess air for safe and efficient boiler operation; fuel has surface area, and takes time to burn. Keeping the excess air volume near and slightly above stoichiometric values for the particular fuel minimizes the formation of NOx, and keeps fuel usage at a minimum. There are a number of commercial methods to measure oxygen. The paramagnetic method uses the magnetic properties of oxygen to cool temperature sensitive electrical components or to rotate a dumbbell shaped mechanism proportional to the amount of oxygen. The fuel cell type uses a low temperature electrochemical reaction to create a voltage related to the oxygen concentration. Both the paramagnetic and the traditional fuel cell type of oxygen measurements are extractive measurements. This means that due to some requirement of the technology such as gas temperature, stream composition or gas pressure, the measurement sensor cannot be inserted directly into the exhaust gas. The exhaust gas must be extracted from the flue duct and passed to the sensor to create the measurement. Given the constraints of ash, lag time, and moisture content in the flue gas, these types of measurements can be problematic when used for continuous boiler process control. The preferred method of oxygen measurement for power plants is actually a subset of the fuel cell type of measurement. The zirconia oxygen measurement has significant differences that make it acceptable for insitu operation. It uses a hot electrochemical, solid electrolyte to measure oxygen content. It has two precious metal electrodes on either side of a stabilized zirconia, solid electrolyte. The electrodes and zirconia comprise the measurement cell. Zirconia electrolyte becomes porous to oxygen ions at elevated temperatures. One side of the measurement cell is exposed to the flue gas containing oxygen, while the other is placed under the influence of a reference gas. For simplicity and cost, clean and dry plant air, around 21% O2, is usually the source of the reference gas. Any difference between the oxygen concentrations of the process and reference gas causes a voltage inversely related to the oxygen content of the process gas. The output follows the Nernst equation. Zirconia is the leading measurement method as a result of its resistance to chemical attack and its generally low sensitivity to other flue gases such as CO2. The requirement for an elevated temperature for the electrochemical reaction allows the measurement to be inserted directly (insitu) into the flue gas without extraction. This makes the technology appealing to power providers concerned with speed of response and product maintenance. It is important to note that the other varieties of oxygen measurement have their place in gas measurement at power plants. For example, the paramagnetic technology is widely used in oxygen measurement for CEM systems. It is a good selection due to its accurate and reliable measurement. While the lower cost, fuel cell type measurement is generally incorporated into portable oxygen measurement systems used for relative accuracy test audits (RATA), boiler tune up and boiler commissioning. It can be confusing to use a fuel cell device to check the performance of an insitu device. If the products are performing perfectly, there can be (and usually is) a substantial difference between the measured oxygen amounts of the same gas sample. The reason is that the fuel cell measurement is extractive. Cool ambient air temperature causes water vapor in the hot flue gas to condense in the extraction tubes. Both measurement technologies are dependent on the partial pressure of oxygen, which changes as the water vapor drops out of the sample. It is difficult to know the new moisture content of the gas stream without an accurate gas temperature measurement, but it is likely that there is still some moisture in the sample. Without knowing the amount of moisture lost in the extraction process, it is impossible to compare the measurement data of insitu product with that of extractive. So, in most extractive systems, the process gas is taken from the flue duct and passed through a drying apparatus, in effect removing all of the water. The now dry sample is passed over the electrochemical sensor and the oxygen concentration is measured. The definition of a dry sample allows a predictable and repeatable conversion between the insitu (wet) sample and the extractive (dry) measurement. The actual differences between the measurements vary with fuel type, ambient moisture content and boiler heat rates, but generally for a coal fuel a difference between 0.2 and 0.7% is realistic. The graph below (Fig 2.) shows actual differences between the wet and dry measurements for a power plant burning PRB fuel. Note that the dry O2 measurement is actually higher than the wet. This is contrary to one's intuition. The loss of water actually increases the partial pressure, and thus concentration, of the oxygen for a given volume. A device used to make insitu measurements should be robust enough to protect the zirconia cell and its related components from harsh process conditions. The measurement cell is typically located at the end of a metal pipe, which is inserted through the boiler wall into the process gas. The length and material of the pipe varies with the required insertion depth and the chemicals and temperatures present in the process. Most manufacturers offer pipe material for longer life in aggressive process conditions like sulfur or chlorine. Inside the pipe is a cable tray mechanism that carries the wires and pipes used to control, monitor and calibrate the measurement cell. Many zirconia detectors have built in heaters that maintain the temperature set point required for operation. The heaters are generally a thin wire, shunt resistor located close to the zirconia cell. Feedback for closed loop temperature control is measured by a thermocouple due to the low cost and simplicity of the measurement. There are also heater-less detectors that use the ambient temperature of the process to provide the heat needed for cell operation. These products are limited to use after the process temperature reaches the operational temperature of the zirconia. Oxygen measurement during boiler start up or shut down may not be possible with this type of device. The zirconia cell generates a millivolt output that follows the Nernst equation. The signal is carried to the detector's junction box via a single wire. Most manufactures incorporate the negative return for the cell into the actual metal body of the probe body for simplicity. Thus, it is crucial to the performance of the measurement that the body of the detector is well grounded. Poor grounding leads to noisy oxygen measurements. The process connection into the boiler is usually a sufficient ground plane. However, weak weld joints in the process connection have been found to cause intermittent grounding problems. Furthermore, local noise sources such as pump or fan motors that cause a temporary shift of the ground noise can affect the oxygen reading. Finally, ground loops between the analyzer ground plane and the detector ground plane, or EMI issues created by poor wire shielding can cause further problems. These types of problems are easily addressed by following installation instructions provided by the product manufacturer. Grounding or noise issues can cause result in inaccurate boiler control. Operators lose confidence in the oxygen parameter due to a noisy measurement that does not agree with fan speeds, draft pressures or intuition. They make manual adjustments to the control scheme according to their preferred alternate boiler trim measurement. While this is generally a safe means to operate, it does not produce the same oxygen trim function as automated boiler control based on actual excess air. The cell signal is transmitted through an external cable to an oxygen analyzer or transmitter. The analyzer converts the cell millivolt and thermocouple measurement to a usable display of oxygen concentration. It also is the temperature controller for heated type detectors. Most 1st tier analyzers have analog outputs that are used for control purposes and contact outputs for alarms or valve operation. Some analyzers even have analog inputs to include other process variables in analyzer calculations. There are other low end products that have a display and minimal functions. As the zirconia cell begins to age, its performance deteriorates mainly due to contamination of the zirconia or the oxidation of the metal electrodes. The cell must be calibrated to assure accurate readings. Calibration is a comparison of the cell output for a fixed gas concentration against the theoretical output at the same gas concentration. 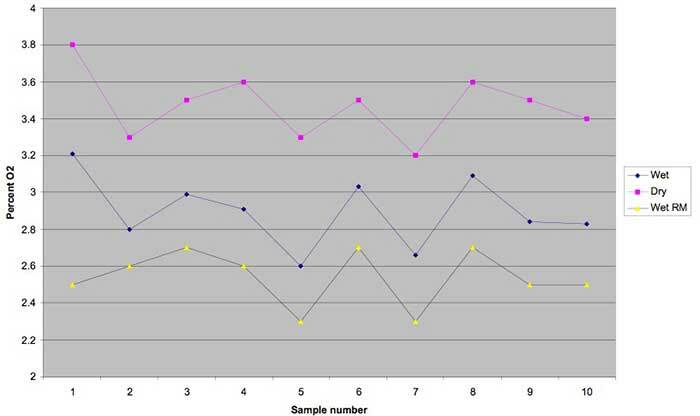 The calibration algorithm corrects differences in the values (Fig 3.). During calibration, gas is carried to the cell via a calibration tube. The "cal tube" extends the length of the detector terminating near the process end of the measurement cell. Reference air is required for the measurement. The reference air is carried to the "reference" side of the O2 cell via a tube that runs the length of the detector terminating near the reference side of the cell. In addition to having the ability to receive output signals most analyzers incorporate many diagnostic features. Heater duty cycle can be used to determine the performance of the heater. A longer heater duty cycle could indicate a reference or calibration gas flow rate that is too high or a pre-indication of a heater short. It is also a good indication that the heater control is functioning. Cell response time is a good indication of the cell performance. Common cell deterioration caused by oxidation slows the response time. Cell resistance shows the resistance through the cell to ground. It will increase as the cell deteriorates or as the ground resistance changes. Cell response and cell resistance are the two best indicators of the cell life. Cell, thermocouple EMF values. These are useful in determining the output and performance continuity of these circuits. Cell life is a measurement of the estimated longevity of the cell. It is usually based on other parameters such as cell resistance and/or response time. Calibration history benefits will be discussed later. The accumulation of flyash on the zirconia cell affects its ability to measure oxygen concentration. Flyash and its constituents can reduce the life of the zirconia cell and affect the cells response time to changes in gas concentration. Many manufacturers sell fine-mesh, sintered metal or ceramic filters to protect the zirconia cell from contact with flyash. The pore size of the filters range from 10 to 100 micron and will keep the particulate off the measurement cell. The filter fits over the cell in a manner to seal it from contact with flyash. With time, the filter mesh can become plugged with flyash. Even a moderately plugged filter can have dramatic effect on the oxygen measurement. The error occurs during calibration. When calibration gas is flowing to the cell, it becomes trapped in the space between the cell and the plugged filter membrane, raising the gas pressure around the measurement cell. 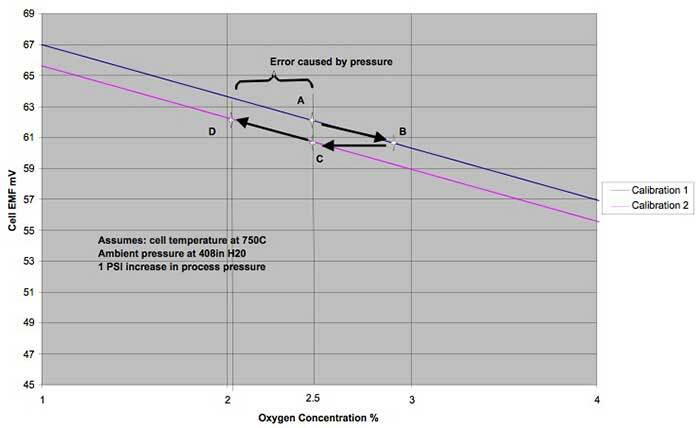 The calibration algorithm determines offsets based on the cell millivolt output at the increased gas pressure. When the calibration is over, the pressure goes back to ambient process pressure. The resulting oxygen measurement is lower than the actual oxygen concentration. This is called pressure induced drift (Fig 5.). Fig 4. Filters offered by various manufactures. In this example, the blue line represents the existing calibration curve and point A the starting oxygen value. 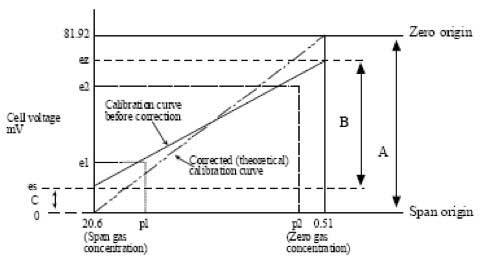 Point B is the oxygen value after the calibration gas is turned on and the pressure increased by 1psig. The analyzer will digitally make 60.6mV correspond to the 2.5% calibration gas concentration (point C, table I) creating a left shift of the calibration data (red line). When the calibration is finished and the calibration gas is shut off, the gas pressure on the cell will decrease back to ambient process pressure. The result is an oxygen reading that is lower than the actual O2present by approximately 0.4%. This is a significant error considering the current industry emphasis on emissions and fuel usage. The boiler operator will inject more air into the combustion process to achieve the oxygen control set point; creating problems with Nox generation and an increased use of fuel. One means to determine if pressure induced drift exists is to monitor the results of the probe calibration. Increasing negative deviations away from expected calibration values are indicative of pressure effects on the calibration. The oxygen analyzer continues to calibrate pressure drift into the oxygen measurement as the filter becomes more plugged with flyash. The periodic cleaning of a filter designed with a large surface area is the best preventative maintenance to this problem. Calibration gas flowrate stability is important for accuracy. Changing the flowrate, effectively changes the pressure in the local area around the measurement cell. This can change the cell calibration in a way similar to pressure induced drift. One way to combat this error is an automated calibration that maintains a constant and repeatable flowrate to the cell. The oxygen analyzer controls the calibration start/stop time, length, stabilization time and frequency of calibration. This information is programmed into the analyzer by the end-user per the plant maintenance requirements. Auto-calibration systems are a recommended option for detector calibration. The main reason is that any zirconia measurement system is only as accurate as the calibration. Often when calibration is required, personnel may not be available to perform the procedure or the detector may be in a location that's not easily accessible. Most vendors offer this option to make life easier for technicians however the end result is an accurate calibration, better oxygen measurement performance and thus better boiler control. Thus far, this paper explored the basics of zirconia products, why it is chosen, how it works and the general manifestation of the product. It now looks at where it goes and why. There are a number of factors that govern the performance of an oxygen measurement system. Installation location, installation quality and number of measurement points, perhaps have the largest impact. The oxygen measurement is used to monitor the excess air in the combustion process. Logic says that the measurement should be near the location of combustion, if not exactly right where the fuel is being consumed. Physical limitations of the detector materials prevent product installation directly in the "fire ball". Metals melt and sag, while ceramics are subject to impact from clinkers and other boiler debris. Furthermore, it is cumbersome and costly to put insitu product through boiler walls covered with steam tubes. So, the measurement is usually set back from the fireball and secondary processes in the flue duct, post economizer before the air pre-heater. However, in many plants there are a fair number of access ways, expansion joints and other "air in" leakage points that can skew the oxygen readings. Many plants are fully utilitizing the high temperature nature of the zirconia technology and moving the measurement location closer to the combustion area. Some plants have even experimented putting measurement probes in the penthouse above the combustion zone. In any case – it is safe to say that closer is better within the manufacturer's product temperature constraints. Efforts to move or install product to eliminate "air in leakage" effects from access ways, or particularly leaky expansion joints can be worth its weight in gold, or coal rather. The quality of the installation is equally important. Items such as reference air quality, integrity of the product's seals, and maintenance accessibility, can all affect the quality of the oxygen measurement. For example, the quality of the reference air is just as important as the quality of the calibration gas. A variable reference gas concentration, such as might be caused by humidity, effects the oxygen measurement directly. Reasonable changes in the reference air humidity can change the process oxygen reading by 0.75% O2. It is a variable error that fluctuates with environmental conditions. Reference air humidity changes can appear like measurement or calibration drift, but a perfectly sound measurement system will "drift" proportional to changes in reference air moisture content. This is a simple and preventable error that translates to fuel and emissions expenditures. Another example is leaks around the detector process connection flange, in the cell or in the calibration system. This problem is particular to negative pressure boiler schemes. Negative draft pulls ambient air (21%) oxygen into the process stream. For leaks around the process connection flange, the density of the cool ambient air makes it possible that the air "drafts" down the detector to the measurement cell resulting in erroneous oxygen measurement. A more extreme and common case of a leak error is in the calibration system. The calibration tube runs directly to the process end of the measurement cell. Leaks in the calibration system bring ambient air directly to the cell. These errors can be significant or small depending on the size of the leak. A leak in the measurement cell itself will have a similar result. These types of errors are some of the most difficult to find. Simple calibration generally does not demonstrate the problem, especially if the leak is in the cal tube. The calibration flowrates are significantly greater than that of the leak. Usually a comparison with another measurement or complete isolation from the leak source is required to positively identify this error. Another area typically overlooked during installation is the maintainability of the product. It is a fact that a product that is in a difficult location to maintain will be maintained less. Efforts to make detectors easy to install and remove, plumb and wire, have good long-term benefit. Finally, the number and arrangement of measurement points is the most under-developed area of combustion O2 measurement mainly because of the apparent cost. The features of a boiler, such as expansion joints, turning veins, duct bends, soot blowers, and internal truss work, will cause the flue gas to stratify, eddy or draft in particular manners that will change with boiler load. Because it is a discrete measurement, the purpose of the O2measurement is to find the best representative sample of what is happening in the combustion fireball. A single oxygen detector located 3 feet down in a 40'x40' duct is unlikely to give the best representative sample throughout the effective range of the boiler load. Conversely, the same flue duct covered with 90 O2 detectors, while attractive to O2 detector manufacturers, is both uneconomic and a maintenance nightmare. It is also not a requirement. 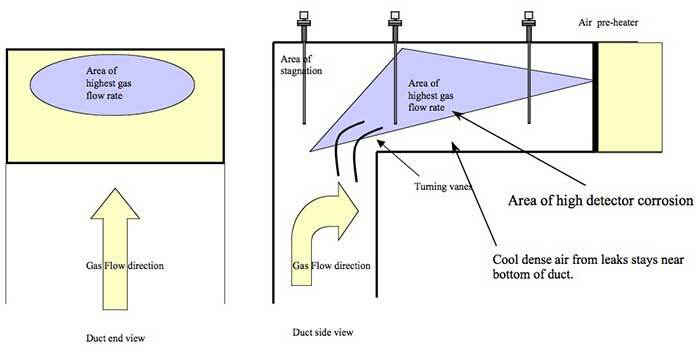 Few plants have spent the time and effort to understand the actual gas flow characteristics in their flue duct. Many plants depend on the flow model created when the plant was commissioned as the basis for their current measurement location, quantity and arrangement. Numerous post commission additions for the purpose of Nox reductions or fuel efficiency undoubtedly change the gas flow through the duct. Some plants use portable test equipment and special access duct access ports to demonstrate the actual profile of the O2 in the duct cross-section. Some even take the effort to construct a matrix showing O2 and flow velocity at different boiler loads in the duct cross-section. The latter is the best way to choose the location, arrangement and number of insertion probes for the process. It cannot be understated the effect that improving the performance of the sample arrangement will have on both fuel and Nox emissions. 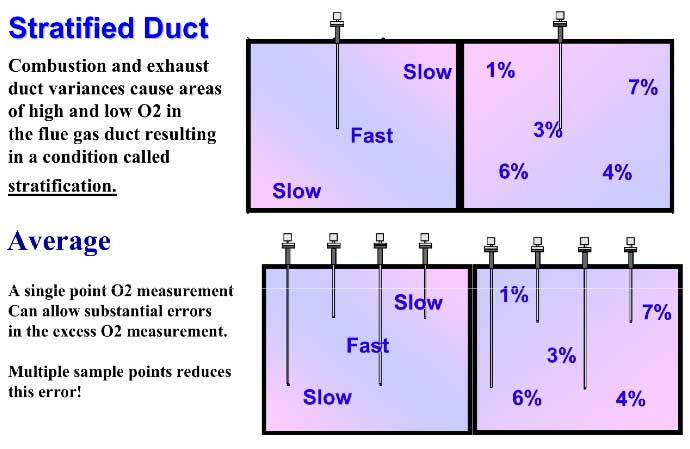 The graphs below (Fig 6 & 7) show a simple but realistic view of a duct O2 profile with some of the considerations one should take when reviewing O2 detector performance. In conclusion, there are many factors that affect the performance of the oxygen measurement in a power boiler. Understanding this measurement allows operators tighter process control and acute response to product problems. The result is a safer boiler, with lower emissions and better fuel usage. Dukelow, Samuel G, 2nd ed 1985 " Improved Boiler efficiency"
Ametek technical staff, 1989, "A guide to Maximizing Combustion Efficiency"
Rosemount Analytical, 2001 "World Class 3000 Instruction Manual"
Lotze, Thomas H, "Zirconia Sensor Theory"
Armitage, Andrew and Firth, Stephen PH.D, and Brook, Jarvis, "The case for the use of O2 and low range CO monitoring to improve combustion efficiency and reduce emissions"
Yokogawa, 2000 "ZR22G / ZR402G instruction Manual"